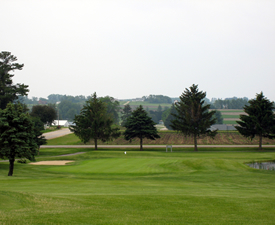 Hole 1: The 1st hole is a par 4 measuring nearly 400 yards. The tee shot is downhill featuring beautiful views of several holes on front and back nine. The hole requires a straight tee shot favoring the left side of the fairway to give you the best angle of approach to the green. Your approach shot to the green is a blind shot, making club selection and aim difficult. The front of the green is protected by bunkers right and left. Aim for the middle of the green. A par is a great score. Hole 2: An uphill, dogleg left par 5 playing over 500 yards. 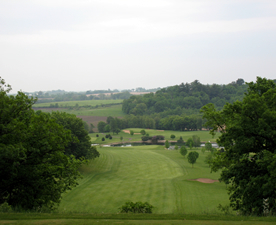 The tee shot on the 2nd hole is difficult because you must hit over a large ridge, making it a blind shot. The fairway is also protected by trees on both the left and the right. Favor the right side of the fairway for the best angle of approach for your lay-up shot. Big hitters can reach the green in two. The green is small and extremely elevated, making both pitch shots and approaches difficult. All downhill putts are tremendously fast. 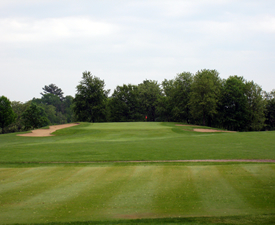 Hole 3: The 3rd hole is one of the most difficult on the course. This par 4 is over 450 yards. Out of bounds protects entire left side of the hole with trees on the right. A tee shot down the right hand side of the fairway eliminates the out of bounds, but makes the angle of approach of the second shot more difficult. Find the fairway and you are faced with a long, downhill second shot to a multi-tiered green protected by a large bunker on the right. You must find the correct portion of the green or you will have a tricky time lag putting. 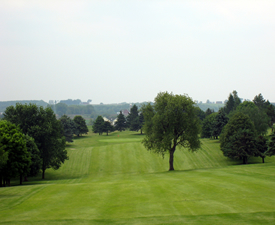 Hole 4: The 4th hole is a downhill par 4 measuring over 410 yards. 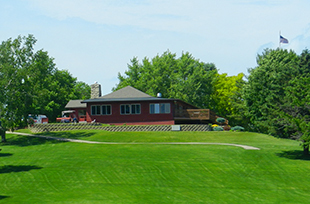 It offers a spectacular view of several holes on the front nine. Out of bounds protects the right side with bunkers in the landing zone on both the right and left sides of the fairway. Favor the left side of the fairway with your tee shot, but be careful not to find the large fairway bunker on the left. A large pond protects the left side of the green on your approach. If you miss your approach shot right of the green you will face a fast, downhill chip. Aim for the middle of the green. Hole 5: An uphill par 3 of over 175 yards. There is no bail out area for your tee shot as the green is protected on both sides by deep bunkers and a steep drop-off long. If you miss long, you will most likely make a double-bogey or worse. The green is sloped steeply from back-to-front, making downhill putts lightning fast. 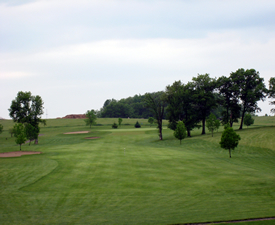 Hole 6: Although the 6th hole only measures 400 yards, it plays much longer as it is uphill from the tee. You must avoid the strategically placed fairway bunker on the left with your tee shot. 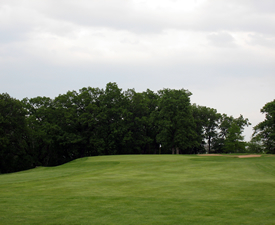 Large trees 50-60 yards from the green obstruct approach shots from the right side of the fairway and right rough. A deep bunker guards the left side of the severely-sloped green. Try to keep your approach shot below the hole so you do not have to face a fast, downhill putt. Hole 7: A slightly downhill par 4 measuring approximately 400 yards. The hole typically plays into the prevailing south wind in the summer, making it play longer than 400 yards. Bunkers left and right require an accurate tee shot. 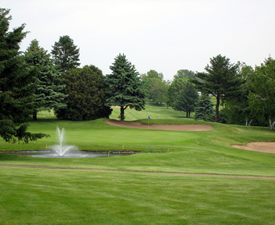 On your approach shot, you will have to carry a large pond as well as a sand trap. Be careful not to hit your approach shot long as you will face an extremely fast, downhill chip shot. Hole8: The 8th hole is a beautiful, dogleg left par 5. It measures over 525 yards. The best shot to hit off the tee is a draw, which will shorten the hole dramatically. Be careful not to hit the tee shot too far left or you will find yourself blocked by huge trees. 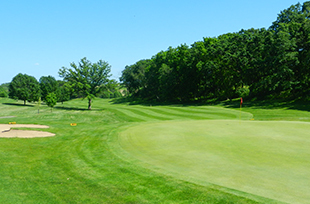 Big hitters can reach the green in two if they can hit a fairway wood over the large oak tree positioned in the right rough approximately 125 yards from the green. If you decide to lay up on your second shot, you will be faced with a tight shot because of the fairway bunker on the left and the large oak tree on the right. A large bunker protects the right side of the elevated green. The green has some tricky undulations, making your birdie putt difficult. 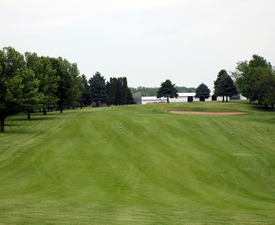 Hole 9: This 360 yard par 4 features the most challenging tee shot on the golf course. 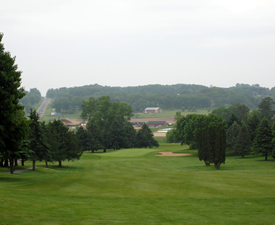 The uphill, dogleg left fairway is guarded by large trees on the left and right. In addition, out of bounds runs the entire length of the hole on the right. Finally, two fairway bunkers, both left and right, make hitting the fairway difficult. The perfect tee shot is a slight draw. If you are lucky enough to find the fairway, you face an uphill approach shot to a green guarded by a bunker short left and right. Try to keep your approach shot below the hole because the green slopes severely from back-to-front. Hole 10: The 10th hole is a 170 yard par 3. The hole plays slightly longer than the yardage because it is subtly uphill. The green is protected by a large bunker right and a steep slope left. 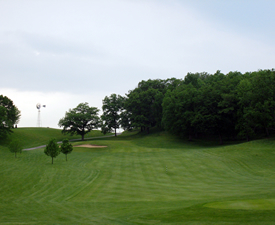 If your tee shot misses left of the green your ball will most likely end up in the hazard because of the steep slope. The green is extremely long from front-to-back, so make sure you take note of the pin position. Otherwise, you will face a long uphill or downhill lag putt. 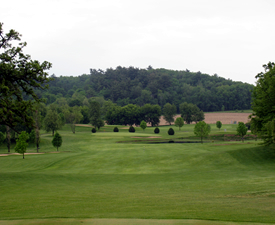 Hole 11: Number 11 is the signature hole at Viroqua Hills. This par 5 measures over 500 yards, but plays much shorter due to the fact you tee off nearly 100 feet above the fairway. The scenic views from the tee box are breathtaking. A fairway bunker on the right and large trees on the left offer two major obstacles for your tee shot. If you hook or slice your tee shot, it will curve more than normal because your golf ball hangs in the air much longer than usual. Most players will be able to reach the par 5 green in two shots. 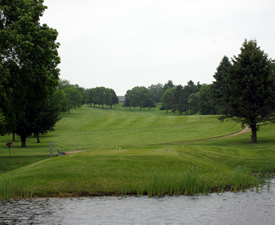 Although the second shot plays relatively short, a large pond guards the right side and back side of the green. The safe shot is to favor the left side of the green on your approach to avoid the water hazard. The slopes on the green are the most difficult to read on the golf course because of the subtle breaks. You will love this unforgettable risk-reward par 5! 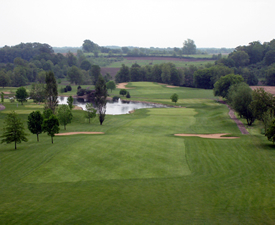 Hole 12: The 12th hole is a slight, dogleg left par 4 measuring over 370 yards. The entire hole plays uphill. The tee shot is fairly wide open, but be sure to hit the fairway as the rough tends to grow very thick on this hole. You will face a severe uphill approach shot to an undulating green. The green is elevated approximately 20 feet and any shots that come up short will roll back in the fairway 10-20 yards. Also, a deep bunker protects the left side of the green. Avoid this deep-faced bunker at all costs because you will have a difficult time saving par from it. The green is extremely fast so you must have excellent touch. 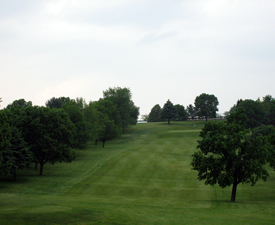 Hole 13: Hole 13 is a downhill, par 3 measuring over 170 yards. The green in one of the narrowest on the golf course, protected by out of bounds and a bunker left, and a water hazard on the right. If you find the green with your tee shot, you can make a birdie because the green is relatively flat. Hole 14: The 14th hole is another risk-reward hole. 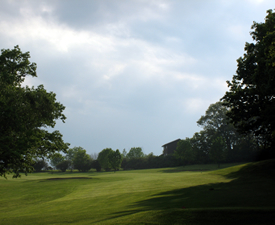 It is a short, uphill par 4 measuring over 280 yards. Big hitters may be able to drive the green with their tee shot, but they face a very narrow opening to do so. 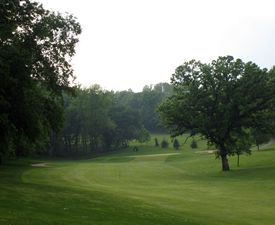 Out of bounds protects the left side while huge Elm trees guard the right side of the fairway. If you opt to lay-up off the tee, you will face a short, uphill second shot to a well-guarded green. A bunker protects the left side of the green. The green slopes from the left-to-right, so favor the right side for an uphill putt. Definitely a birdie opportunity. Hole 15: Number 15 is a short par 3 measuring over 130 yards. This hole is another great birdie opportunity if you are able to hit the green from the tee. A small pond swallows balls hit short and left while a deep bunker guards the right side of the green. 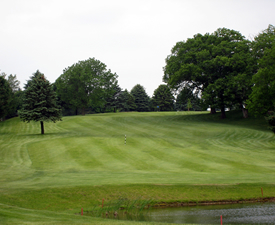 Be careful not to hit your tee shot over the green, as multiple trees and a bunker will make saving par difficult. Hole 16: The 16th hole is yet another risk-reward par 4. 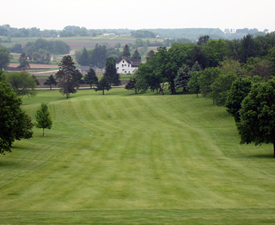 It plays approximately 300 yards and big hitters can reach the green with their tee shot. Out of bounds protects the entire left side of the hole so be careful not to hook or pull your tee shot. Also, there is a large bunker in the middle of fairway at approximately 220 yards from the tee. If you decide to lay-up from the tee, you will have a short approach to a very large green. Knowing the pin location is a must so you are not left with a 50 foot putt. Bunkers short left and short right guard the front half of the green. Hole 17: Hole 17 features another demanding downhill tee shot. On this 420 yard par 4, you will have to hit your tee shot precisely or you might find yourself behind a huge Elm tree placed in the middle of the fairway. In addition, large trees are located in both the left and right rough areas. The approach shot is difficult as well because it is blind and uphill. Aligning yourself properly is a must if you expect to hit the green in two shots. The elevated green is protected by a bunker on the right. The green slopes from right-to-left, so putts from the right side are very fast. Hole 18: The final hole is yet another difficult tee shot that requires precision. The uphill, par 4 hole plays over 375 yards. The fairway slopes from left-to-right, so favor the left-center of the fairway on your tee shot. If you miss the fairway right or left, trees will most likely obstruct your approach shot. A deep bunker guards the right side of the elevated green on your approach shot. The green slopes severely from back-to-front, so try to keep your ball below the pin. Downhill putts on this green are among the fastest on the golf course.